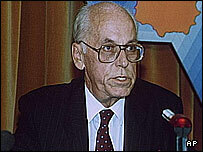 2004 November - Defence Minister Margus Hanson resigns after classified documents are stolen from his home. 2005 February - Foreign Minister Kristiina Ojuland is sacked after classified documents are found to be missing from ministry. 2005 April - Reform Party's Andrus Ansip confirmed as prime minister. 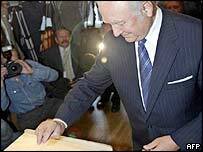 2005 May - Estonia and Russia sign treaty delineating border. 2006 May - Parliament ratifies EU constitution. 2006 September - Toomas Hendrik Ilves, a former foreign minister, is elected president. 2007 February - Parliament passes a law prohibiting the display of monuments glorifying Soviet rule, paving the way for the removal of a controversial Red Army war memorial in Tallinn. 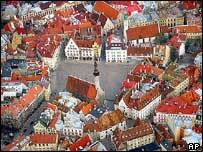 2007 March - Estonia becomes the first country to allow internet voting for national parliamentary elections. The prime minister's Reform Party wins by a narrow margin. 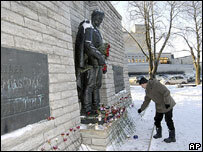 2007 April - Authorities remove a controversial Red Army war memorial in Tallinn. One person is killed and more than 40 injured as protesters, mostly ethnic Russians, try to halt the removal. Russia warns of serious consequences. 2009 January - Estonian court acquits four ethnic Russians accused of leading riots sparked by government's response to relocate a Soviet-era war memorial in Tallinn. 2009 June - Parliament approves move to double size of Estonian contingent serving in Afghanistan as part of the International Security Assistance Force (ISAF), from 150 to around 290 soldiers. 2011 January - Estonia adopts the euro. 2011 February - Parliamentary elections. The Reform Party and its coalition partner IRL retain their majority in parliament with 56 out of 101 seats. 2011 August - Toomas Hendrik Ilves is re-elected president for a second five-year term.